Affordable office, print shop, mail room and banking equipment at abc-i.com. Check our prices before you buy. The JustRite JES electric seal press is the highest quality automatic embosser on the market. No other model has its quiet fluid action and gear saving "overload" functions. single pass, reducing labor costs and increasing productivity. 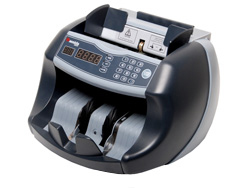 Cassida 85 heavy duty currency counters Bill counters need to be tough and reliable, just like the Cassida 85. UV & MG counterfeit detection. Check/Document signing machines save time and increase productivity. No need to spend hours manually signing accounts payable or payroll checks or form letters when a check signer can do it in minutes. Internal security features prevent tampering and unauthorized access, making these devices ideal for any organization. HSM Securio P36L6 OMDD Combo Security Level 6 Cross-Cut Paper, CD and DVD Shredder Perfect commercial government priced high security shredder that shreds BOTH paper and CDs! HSM Securio shredders have quality design, economic energy management (EMCS), absolute ease of operation, and low-noise output. You have just found the website with some of the most competitive prices on the internet. Brouse the index on the left side of this page to find equipment and supplies for your office, print shop, mail room or bank. . Thanks for visiting us. Come back soon.